An ideal park or beginners board, the Sapient Future Snowboard features a zero-camber shape for most points of contact with the snow, and minimal bucking when connecting turns. The softer flex makes it ideal for any groomer's situation, and the perfect flex for butters, rails, and other park features. The extruded base is sure to hold up to even the toughest conditions, with minimal waxing and maintenance. Pair with a soft pair of bindings and some comfy boots to match, and you'll be cruising in no time! Basicaly looked like the image. A little bit more shiny... But not in a creapy way. The price... And the video review sounded like it was a totaly ok board. Would this board be a good first board for someone who is 5'7", weights around 160 and wears an 8.5? Sapient states that you could ride the 153cm length ok. This will be a good purely entry level board, but not a great deck to progress on. I'm 5'7 165 with a size 12 shoe, would this be a good board for me? You have more control over your board the shorter the board is so you might want to go with a 155 to 160. Up to you. I'm 5'6 with a size 9 and this board works great. I'd definitely recommend it. Do the snowboards come waxed? BEST ANSWER: They come with a factory wax that is ready to go when you rip off the shrink wrap. Lasted for two long days after which copious tree runs took their toll. Your mileage may vary depending on what conditions you snowboard. Don't remember but I assume so. I'm pretty sure every board has a factory wax on it when you first buy it. Right, John. It will be factory waxed. You'll want to add a layer after a couple of times out. Yes. It has a flat profile shape so that will be very easy to control. I would recommend you get the smallest size available. 143-150 if that size is available. 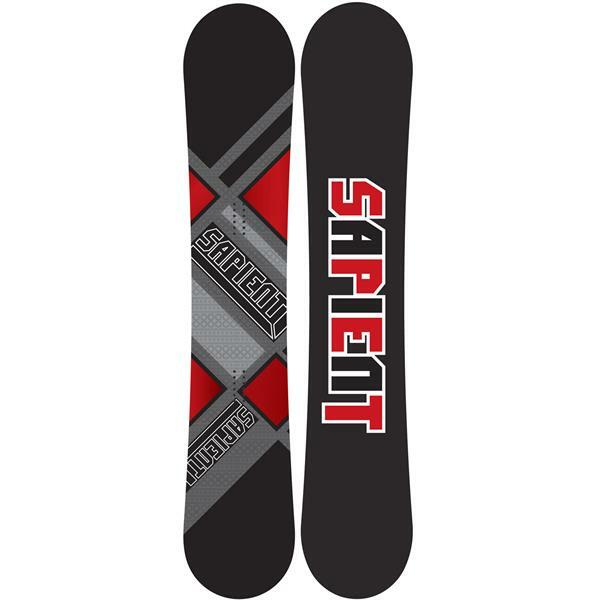 will the sapient wisdom snowboard bindings fit? Hi would this board work for someone who I around 5'7" and weighs around 165 and wears a 10 shoe size? BEST ANSWER: Definitely. The 153cm Sapient Future Snowboard would be the best size. Are these compatible with the burton unidisk? I'm about 5"8 an about 125lbs. Trying to set myself in around 130lbs. Right now I'm riding a board I got from a friend that is a 157cm (w) I can control it but i feel it's to big for me an I either wipe out or feel like landing sketchy. I was looking at possibly buying this sapient board would this be good for me an the flex of it as well for doing butters an terrain such as rails, boxes an jumps. I'll also go down trails as wellwell at times. What would be the best size board for me? I would agree that the 157 is too big for you. Either the 150 or 153 would be great for you. If your main focus is in the park, I would suggest a smaller board. If you spend equal time in the park and the rest of the mountain, the longer board will be great! It is a softer board so you should be able to pull of buttery moves no problem! Looking to purchase for my son- he wears an 8 1/2 and is 5'5" . Is this a good choice for him? What additional things would I need to purchase for this board? Bindings? BEST ANSWER: Hey there Toni, yes, I think that this would be a great board for your son. How much does he weigh? I can help you with sizing this way. So for a full set up you will need bindings and snowboard boots. Would this be a good first board? Yes the Sapient Future Snowboard would be a great 1st snowboard. The extruded bas is low maintenance, the biaxial fiberglass is soft, the wood core has additional bamboo laminates that give a consistent flex, and the zero-camber with late kick is great for all types of terrain.